What is An Event Broker? An event broker is middleware software, appliance or SaaS used to transmit events between event producers and consumers in a publish-subscribe pattern. How is an event broker different from a traditional message broker? Traditional message brokers run on-premises and are wedded to a legacy ESB. Solace event brokers can be deployed in any and all your environments, on-prem and natively in your public and private clouds. They can be deployed alongside your iPaaS and in your PaaS. In short, they support the development of modern cloud native and event-driven apps and microservices. 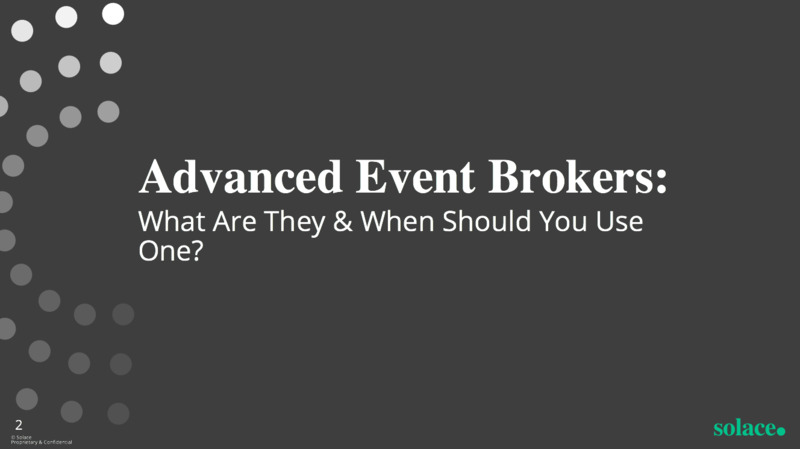 What is an “advanced event broker”? What makes it advanced? Next up: What is an event mesh?